We had a good morning!!! And this does happen occasionally. A little more often here lately, but we are still walking on eggshells waiting for the next bomb to drop. So let me say what it's like when it's good. Today we woke up happy and went for a ride. Lowell was invited along and he even was chosen to drive. And the ride was mostly without incident. I did drive the second half of the trip as there was a bit of tension building in the air. As I am driving, I look over to see a big smile and I hear, "How am I doing lady? You prouda me?" When I tell him that he is doing so good and I am so proud of him, the next line is, "I'ma buy you some flowers. I'ma buy you a diamond ring." I hear this line a minimum of five times a day (even when things are bad, we still have our diamond ring moments). Lowell says that Jesus is waiting with a big ole diamond for my crown when I get to heaven and it's going to have this guy's name on it. That would be nice, as I am fairly certain there will be no diamond rings bought for me here. I am also fairly certain there will be no flowers. We did find some flowers at the Dollar Tree, and he bought them; but then he decided he would rather keep them than give them away. So no diamonds, no flowers, and that's okay with me. Things are a little different for my mom back home. On the day before Valentine's Day, she calls and tells me she just got 72 roses and a marriage proposal. 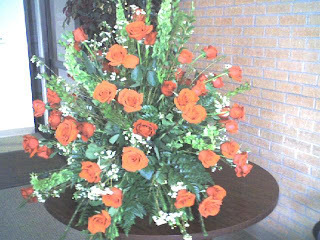 My immediate thought is not, "Congratulations;" it's, "what on earth does an arrangement with 72 roses even look like?" After a long day of waiting, I finally got a picture. It is pretty incredible. Not that I wouldn't absolutely kill my husband if he paid that much for flowers, but hey, when it's not my money, go for it. So, back at home, my mom is engaged, my dad is engaged (he sends flowers to his fiancee all the time, for no reason) and the floral shops are staying busy. And here I am in Kansas getting empty promises from the guy next door. But that's okay, because even without the diamonds and roses, I am living a pretty full life with a husband who loves me and the greatest kid in the world. And truly, every day is a new adventure. Wow! That's funny--I was just thinking about your mom the other day and wondering if she was married or just seeing that man she was with in church (that one time Paul and I visited Cov. Pres.). Same guy?? Anyway, please tell her congratulations from me! !